Glasgow Harbour is the name given to the area around the mouth of the River Kelvin as it flows into the River Clyde. Once occupied by docks and shipyards, in the summer of 2011 this became home to Glasgow's magnificent Riverside Museum. 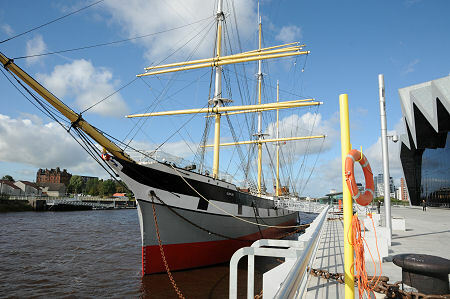 Moored alongside, on Pointhouse Quay, is the Glenlee, a three masted steel-hulled barque built on the Clyde in 1896. Open to the public, "The Tall Ship" complements the Riverside Museum perfectly, and helps link the museum to the story of the River Clyde. Entry to The Tall Ship is via the very attractive ticket office and reception on the quayside immediately to the south of the Riverside Museum. Parking is available on the far side of the museum, and Glasgow Harbour is also well served by public transport. It is worth noting that while, like any ship, Glenlee has its share of steps and ladders, she is accessible to a very high degree. The insertion of a lift during renovation means that, when combined with ramp access to the ship herself, most of the ship is accessible to visitors in wheelchairs, even the depths of the cargo hold. On boarding the Glenlee, visitors find themselves on the central section of the weather deck, the main upper deck of the ship. Once they have finished admiring the ship's reflection in the south front of the Riverside Museum, and wondering at the amazing complexity of the rigging above their heads, most visitors will commence with the short climb to the raised fo'c'sle deck, which offers superb views (and photographs) back along the length of the ship. Beneath this deck is an area accommodating the anchor machinery as well as the small hospital cabin and the carpenter's workshop. Moving back down the weather deck brings you to the main deckhouse. One end of this forms the galley, while the rest is pretty cramped living quarters for many of the crew. The forward deckhouse provides space for an exhibition, and is where you find the upper level of the lift. Moving back towards the rear of the ship takes you up through the strata of society on board. The rear deck houses the wooden chart room with, behind it, the ship's wheel in what appears to modern eyes to be a very exposed location. You can't help wonder why the idea of enclosed bridges took so long to catch on. Perhaps if a ship was being powered by the wind, only someone standing out in the wind could gain a sensitive enough feel for it to effectively control the vessel. Beneath the rear deck are the quarters of the ship's officers, gathered round the captain's saloon, with its wood furnishings and heating stove. The captain's cabin could hardly be described as luxurious, except in one respect: the neighbouring en suite is home to a full size bath. Keeping the water in with the ship under way must have been a challenge. It is only when you descend to what is known as the tween deck that you begin to get a real sense of just how big Glenlee is. She is 245ft 6in or 74.4m long, and 37ft 6in or 11.4m wide. The tween deck is subdivided, with the forward part forming a shop and cafe, but the sightlines are still sufficient to begin to appreciate the scale of the construction. Carrying on down the ship brings you to the lower deck. The forward section of this forms the Galatea education room, in which school and educational visits are hosted. The rear part of the deck, linked to it by a walkway along the side of the cargo deck, is home to the heads (the toilets), as well as to the ship's engine room and the generator room. Nautical engines never fail to impress, and those on Glenlee, even though she was originally built as a sailing ship, are no exception. The cargo deck is where the Glenlee earned her keep, and it is here that you begin to appreciate the significance of her design. In effect she was built to provide the largest possible cargo space within the sleekest possible design, and the use of steel ribs and riveted plates in her construction meant that she was vastly better suited to her role than earlier generations of wooden hulled ships: even though her overall appearance might be superficially similar. Part of the cargo deck has been turned into a children's play area, and another part into a cinema for audio visual presentations. But much of it is left in a condition intended to allow visitors to appreciate the sheer volume of space available for cargo when the ship was in service. As you return to the weather deck, it is with the sense of having found far more to look at and think about than you expected, on a ship that is far larger than you possibly imagine when simply standing on the quayside and looking at it. The Glenlee was built by Anderson Rodger at the Bay Yard in Port Glasgow and launched into the River Clyde on 3 December 1896. The steel from which her hull was made came from the Lanarkshire Steel Company in Motherwell. It took just ten days after the launch for the final touches to be made to accommodation and the rigging, and on 13 December she sailed for Liverpool. She then loaded with a general cargo, and on 21 January 1897 set sail for Portland on the Pacific coast of the United States, with a crew of 26 commanded by Captain Charles Morrison. Her first voyage would last 369 days, and she returned to Britain in February 1898. To modern eyes her first voyage seems remarkably soon after her launch, but perhaps the best way to think of it is as a new ship being used very much as a modern haulage company would use a new truck: you buy it, issue it to a driver, and set it off, collecting and delivering goods around the UK's road network. Only in the 1890s it was a world's seaways being travelled rather than a nation's motorways, so times and distances were both rather longer. The Glenlee was sold to Robert Ferguson & Co of Dundee in March 1898, and renamed Islamount. She continued to sail as the Islamount until 1919, when she was sold to Italian owners and renamed Clarastella. During her 22 years under the Red Ensign, Glenlee/Islamount spent some 5,000 days under sail. During this time she sailed completely around the globe four times, and her longest single voyage lasted 1,269 days, from 18 March 1916 to 20 October 1919. The name of the game was profit, and a sense of the way she was operated can be gained from an account of one voyage she undertook. In February 1914 the Islamount set sail from Antwerp with a general cargo bound for Buenos Aires. Later in the same trip she carried coal from Newcastle in New South Wales, Australia, to Talcahuano in Chile, and then carried nitrates (a polite name for guano) from Tocopilla in northern Chile to Durban in South Africa. She concluded her voyage carrying rice from Rangoon in Burma to Liverpool, where she arrived in April 1916. After all costs were covered and the crew paid, the owners made a profit from this one voyage of £4,048 and a few shillings and pence. As Clarastella, the ship spent much of 1921 trading in the Mediterranean, though the details are a little hazy. It was during this period that engines were first fitted to supplement the sails. In 1922 she was purchased by the Spanish Navy, renamed the Galatea, and converted to become a sail training vessel. The Spanish Navy made numerous changes to the vessel, most intended to convert a ship intended to carry cargo into one able to accommodate a training crew of up to 17 officers, 30 petty officers and 260 ratings. The Galatea retired from active service with the Spanish Navy in 1959, but continued to be fully maintained by them until 1981. She later fell into disuse, and by 1990 had been vandalised, sunk, refloated and left to rot in Seville. It was here that in 1990 she was noticed by a British naval architect who realised that she was a very rare surviving example of a Clydebuilt sailing ship. 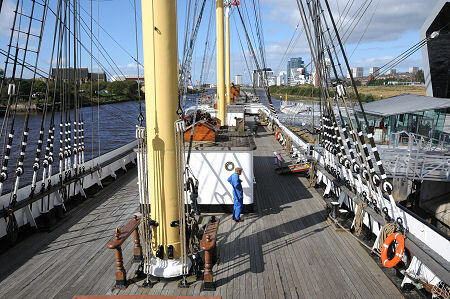 She was subsequently purchased by the Clyde Maritime Trust, towed back to Glasgow, and lovingly restored as the Glenlee. She was put on display on the Clyde at Yorkhill in 1999, and in 2011 was moved to her new home beside the Riverside Museum at Glasgow Harbour.